Using your FACEIT account (connected with your Steam account), log in to the Ticket Fairy and sign into the account you purchased your tickets with. 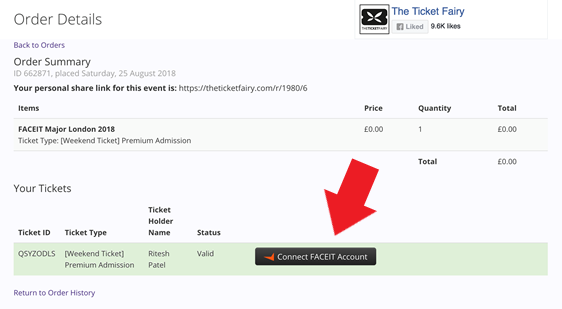 Navigate to "Orders" and locate your FACEIT London Major tickets, where you can link the ticket to your FACEIT account. Once you have completed this step, your FACEIT Major ticket will be linked to your FACEIT account, and the message “Connected to purplelight” will be displayed to confirm this. The first Valve Major event to be held in the United Kingdom is currently in the middle of its Legends Stage, which will last until Sep. 16. The top eight teams will move on to the Champions Stage, which will be broadcasted live from the SSE Arena, Wembley. You can keep up to date with all the action right here, from our event hub!